Women everywhere suffer from the 'nothing to wear' syndrome ocassionally in their life. And our beloved celebrities are no exception. No matter how much we dread wearing the same outfit twice, if not posting pictures on Instagram in the same dress more than once, we all have those heart-wrenching moments when after looking blankly at our wardrobe for hours we end up picking an outfit that we have, well, worn multiple times. Jahnvi Kapoor is no different, she recently grabbed attention for repeating outfits and we could completely relate to her. Janhvi is not alone, other Bollywood A-listers are also challenging the cliche that celebrities cannot repeat their clothes by choosing to wear the same clothes on more than one occasion and slaying it like a boss. EVERY. SINGLE. TIME. Check out the B-town stars who we found repeating their clothes, and we love them even more for it. Janhvi wore this multicolored Caroline Constas top and ripped denims to the Ed Sheeran concert in India in 2017. She had also worn the same top on her US vacation back in 2016. Deepika wore this lacy off-shoulder mini dress to SRK's birthday bash in 2017 and looked every inch chic. She had worn the same outfit to the IIFA awards a year back. Anushka Sharma was spotted wearing grey checkered trousers paired with a white cami and a cropped denim jacket while accompanying hubby Kohli to Bengaluru for a match. The actress was once again photographed wearing the same outfit at the airport and giving lessons on how to do it like a boss. 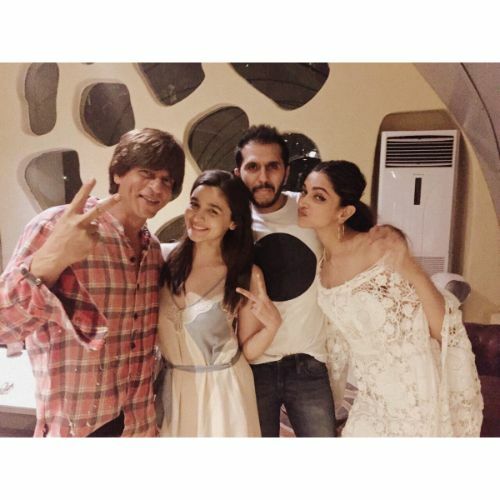 Alia seems to be in love with this graphic tee from French Connection. The actress was spotted wearing it multiple times and each time styling it to perfection. 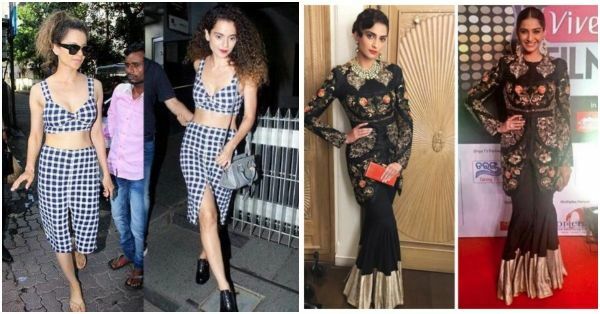 Kangana stepped out in this checkered, front-slit pencil skirt and bralette top for two different film promotions and we think she looks tres chic both times. Malaika wore this check crop top with denims and sneakers while vacationing in the US in 2017. She paired the same top with a white ruffled skirt for a brunch in the same year. 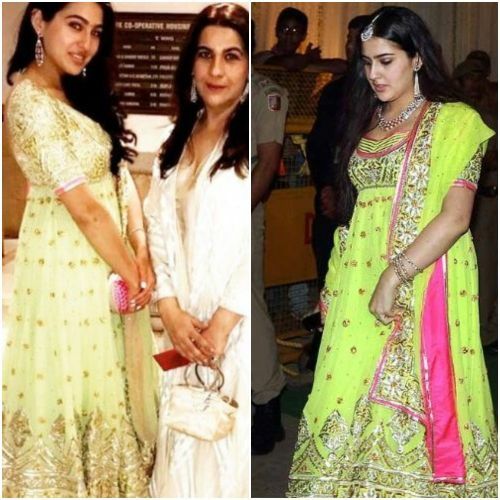 Sara Ali Khan wore this gorgeous Abu Jani-Sandeep Khosla neon green anarkali to a diwali party in 2017. The actress had also worn the same outfit back in 2012 at the wedding reception of Saif and Kareena. However, she got the neckline slightly altered to make it look more plunging! Parineeti Chopra wore the same net black Hemant Nandita dress to the Priyanka-Nick post roka party that she wore at a shoot in Dubai in 2017. 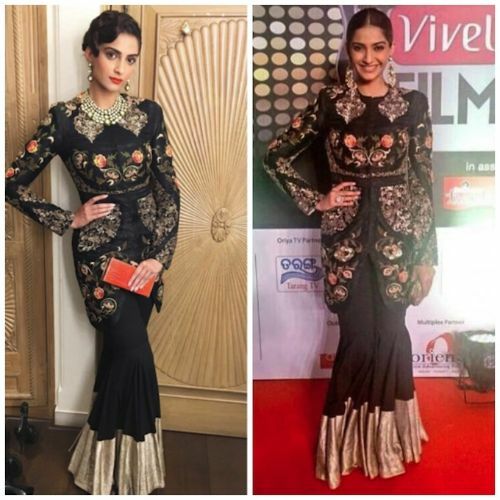 B-town's diva Sonam K Ahuja paired this chic Anamika Khanna jacket with a black sharara at the IIFA awards 2014. She repeated the same outfit at another event in the same year. 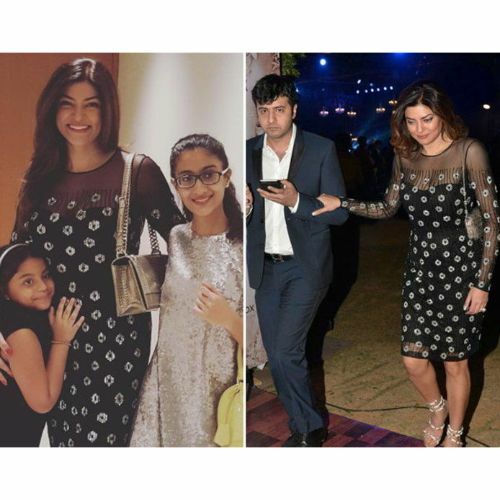 Sushmita Sen wore this polka dot sheer dress on her 41st birthday bash. She also wore the same dress a few months ago on a date night with ex-beau Ritik Bhasin.